American politician and diplomat, Union general in the Civil War, b. Franklin, Ohio. He studied law and practiced in Dayton. Schenck was a Whig in Congress (1843-51) and minister to Brazil (1851-53). During the Civil War he fought at both battles of Bull Run and in W Virginia. He reentered Congress and became a leading radical Republican (1863-70). While minister to Great Britain (1871-76), Schenck, for a consideration, allowed the Emma Silver Mining Company to use his name in promoting its stock, which soon proved fraudulent. A congressional investigation ultimately forced his resignation. ROBERT C. SCHENCK. (1809-1890). Union Major General and Congressman. Autograph Letter Signed as president of the Western Air Line R.R. 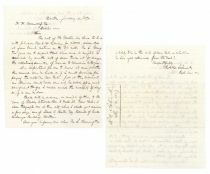 Co. Two pages, 7 ¾” x 9 ¾”. Boston. January 2, 1857. Scheck writes to the cashier of the Ilion Bank, in part: “The note … with Johnson Clark … for 5,000, discounted at your bank matures…Mr. S. Remington gave me to expect that when due it might be renewed…It is important for me to know at once whether this renewal can be made …can you inform me when S. Remington is likely in the city of New York of whether he has yet returned from the West … Robt. C. Schenck.” A very interesting association. Fine. 1876, New York. Stock certificate for six hundred sixteen shares issued to and signed on verso by ROBERT C. SCHENCK (1809-1890) Union Army General during the American Civil War and a American diplomat. Schenck was at both Bull Run battles, took part in the Shenandoah Valley Campaign and the Battle of Cross Keys. Blue/Black. Vignette of locomotive at top center. Vignette of Frederick Billings at bottom center. 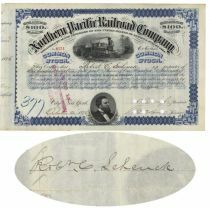 Punch and stamp cancellation do not affect Schenck’s signature. Light toning at edges. Overall Extremely Fine.